Need some motivation to get through those lonely miles on the indoor trainer? Edge 520 delivers with a suite of training capabilities when paired with compatible ANT+ indoor trainers. Let’s say you need to train at an average power of 240 watts. Just set the target on Edge 520, start pedaling, and the trainer will automatically adjust to keep you at your target even as the 520 shows your stats. You’ll be able to also follow a course that you or another rider created and literally race the recorded stats, with the trainer adjusting resistance to match the elevation profile. Pair it with a power meter and Edge 520 offers an additional set of features, like FTP and watts/kg tracking, so You’ll be able to compare yourself to others, as well as cycling dynamics². A built-in FTP test helps you establish your baseline either on the trainer or on the road. Add heart rate³ and the 520 can derive your VO2 max estimate and post-ride recovery time, which indicates how long before you should attempt another hard effort. Edge 520 compromises nothing in the case of display — 2.3 inches of high-resolution color. We maximized the display so you get the most live area in the case of the compact size of the 520. You’ll also appreciate the screen clarity in all lighting conditions. Edge 520 is compatible with ANT+ sensors, including Varia? bike radar and lights4, speed, cadence, heart rate, Edge and VIRB® remotes and compatible weight scales. It also integrates with Shimano Di2 electronic shifting systems5 to display your current gear on the screen. Edge 520 is also compatible with ANT+ power meters, including the Vectorseries. 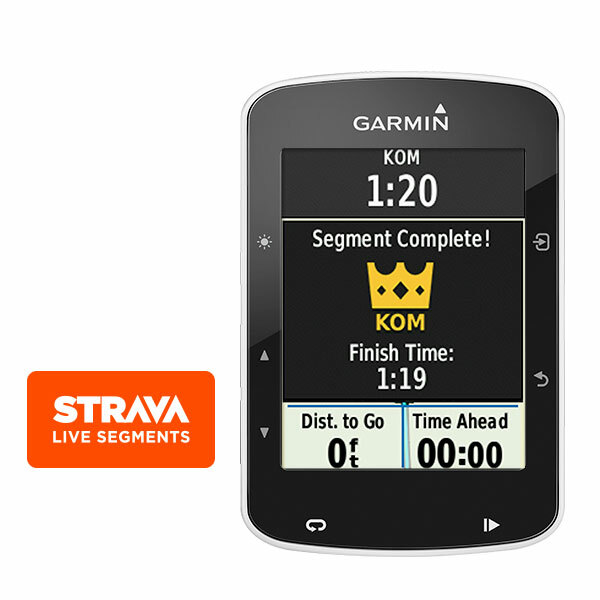 When paired with your compatible phone and the Garmin Connect? Mobile app, Edge 520 offers live tracking, smartphone alerts, social media sharing, weather and wireless uploads. Once your ride is complete, the data can be automatically sent to Garmin Connect?, our online community where You’ll be able to save, plan and share your rides. We have actual Real Live People available to answer your questions! All of our new items come Brand New in the Box unless specified. If you have any questions regarding warranty please feel free to message or call anytime. All Colorado shipments will be charged state sales tax at the time of checkout. PROMPT payment is required. If you anticipate a delay in payment longer than day after today, please notifiy Mountain Cycle Sports right away. We will cancel orders for non-payment right away. Packages are usually shipped next day of payment receipt (excluding Saturday/Sunday). We will not change shipping addresses. Please make sure your shipping address is correct at time of payment in Paypal. All orders are shipped via UPS, FedEx, DHL, or USPS. International buyers are responsible for all taxes and fees including VAT. We reserve the right to make a choice carrier based on shipping method selected at time of payment. Combined shipping is done at the sellers discretion. If you purchase more than one item from us, they may arrive in separate packages. We will't delay shipment once payment has been received. All items are for your use at your own risk. Any recreational activity may result in risk that may cause bodily harm or injury. By purchasing ANY item you agree not to hold Mountain Cycle Sports or any affiliate liable for ANY injury. Mountain Cycle Sports accepts returns on items that are in new or original condition and in the UN-opened box. Once a box is open we are unable to accept return unless defective. We do accept apparel back for sizing exchange and we waive the fee for exchanges. There is a 10% restocking fee for all items returned not the result of a shipping error. Buyer must return the item exactly as received within 30 days and will be responsible for all additional shipping charges. We do our best to present accurate, detailed information about every item we sell. If you have any questions, please contact us before placing your bid.